You can never have too many kugel recipes. I love the seasonal flavor of this sweet and grown-up Rum Raisin Cranberry Kugel. The rum idea came from a reader named Nancy (yes, I do read every single one of your comments!) who wrote that she often plumps her raisins in rum before adding them to her kugel. I thought the idea was inspired. 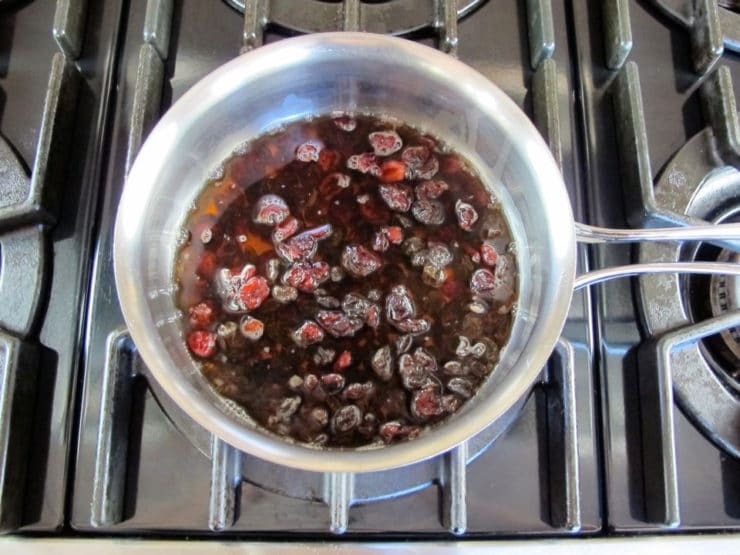 She soaks hers overnight in rum, but I didn’t have the time or patience for that, so I simmered both raisins and dried cranberries in hot rum on the stovetop. The alcohol is mostly cooked out, but the essence of the rum remains, giving this kugel a rich flavor and a wonderful seasonal quality. I also added chopped walnuts, brown sugar and autumn spices for texture and to “warm up” the flavor. It turned out scrumptious! This Rum Raisin Cranberry Kugel would be great for breaking the fast on Yom Kippur, as part of a Sukkot meal, or for Hanukkah (and Thanksgiving, since both start on the same day this year!). You could even bring it to a Christmas potluck if that’s the holiday you celebrate. 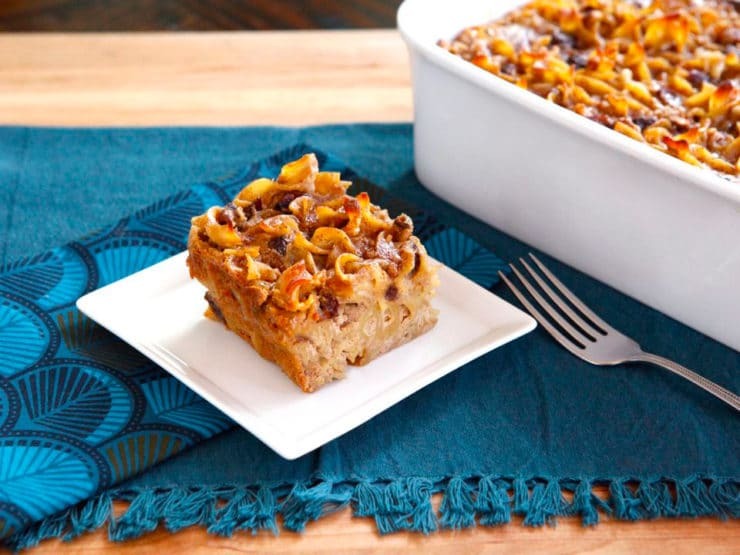 This kugel definitely has an autumn/winter holiday vibe. Kugels are easy to make, easy to transport, and always a crowd pleaser. Or, make it just because. It’s carb heaven, the ultimate comfort food! 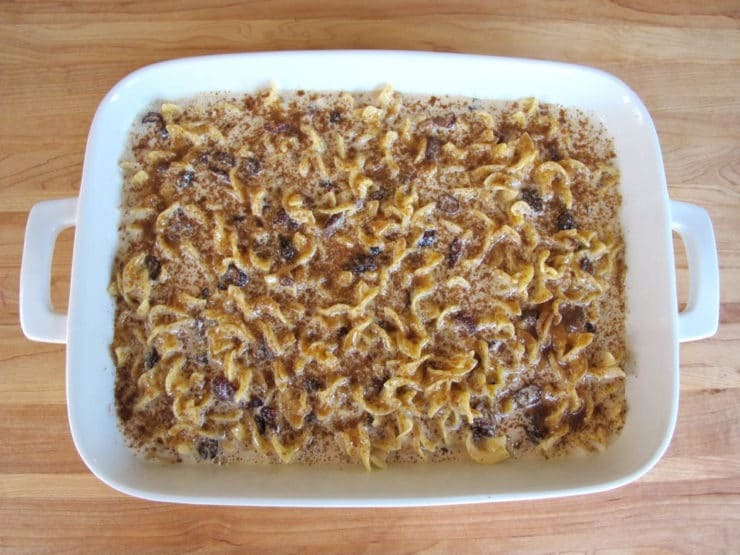 This kugel appeared on Daily Candy the week before Rosh Hashanah (yay!). In case you don’t know about it, Daily Candy is a really fun site; they email you a new surprise each day based on where you live. Sometimes it’s an introduction to a brand, or an event, or a website you might love. My kugel recipe was emailed to the Los Angeles area, because that’s where I live. Definitely worth checking out and subscribing! What’s your favorite way to make kugel? 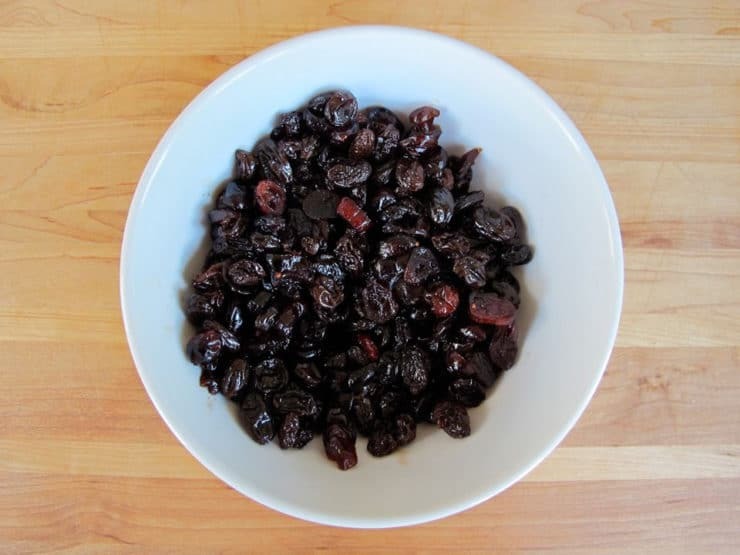 Place a rack in the middle of your oven and preheat to 350 degrees F. On the stovetop, place the raisins and cranberries in a small pot and cover with rum. Simmer the mixture over medium-low heat for about 20 minutes, until the fruit has plumped and all the liquid is absorbed. Keep an eye on it to make sure it doesn't burn. Remove from heat and reserve. Meanwhile, bring a large pot of water to a rolling boil. Add the noodles to the pot, bring back to a boil, and let the noodles cook till tender (not overly soft) for about 5 minutes. Drain, rinse briefly with cold water, and return to the pot. 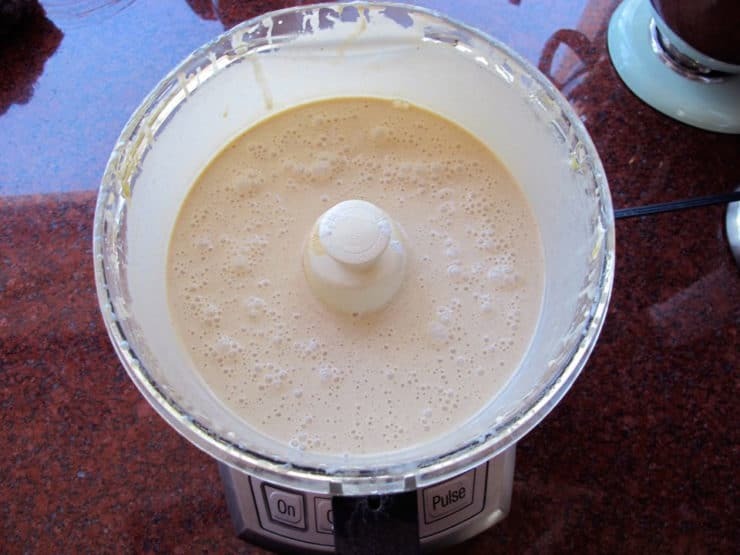 In a food processor or blender, mix together the eggs, sour cream, ricotta, cream cheese, sugar, brown sugar, melted butter, vanilla, spices, and salt. Pour the blended egg mixture over the cooked noodles in the pot and stir until well combined. 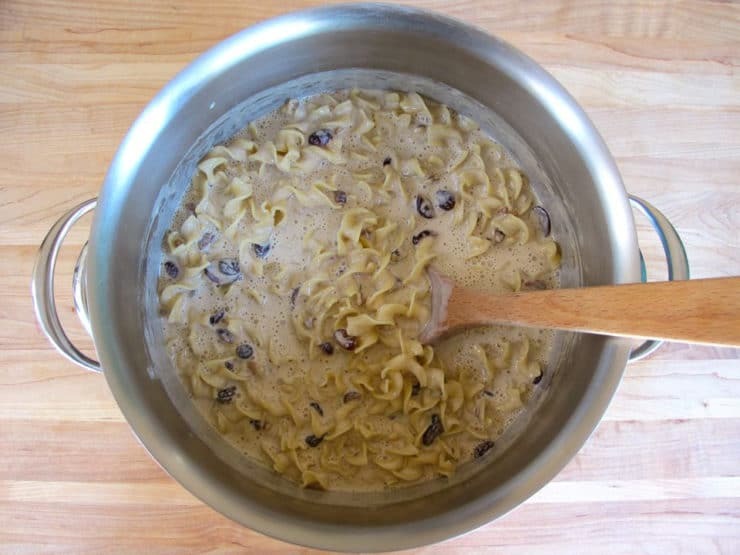 Add the rum raisins, cranberries, and walnuts, and stir into the noodles. Spray a 9-by-13-inch baking dish with nonstick cooking spray. Pour the noodle mixture into the dish. Top the kugel by sprinkling generously with sugar and lightly with cinnamon. Alternatively, use your favorite kugel topping (streusel, crushed graham crackers, cornflakes, etc.). I like this kugel with a graham cracker topping, but many prefer the crunchy texture that forms when the noodles bake and brown on top. Either way works! 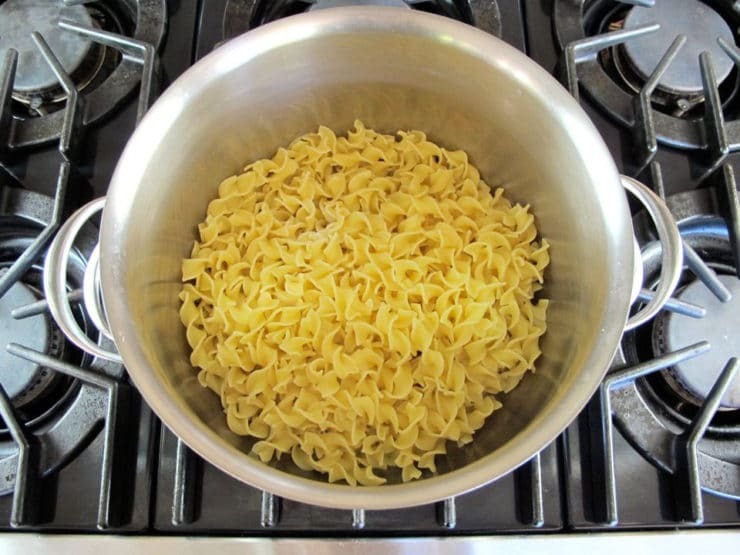 Bake about 60 minutes, turning once halfway through, until the center is set and the tips of the noodles turn golden brown. Remove from the oven. Let rest for 15-20 minutes before slicing. For a cleaner slice, let the kugel cool to room temperature before cutting. Serve warm or cold. If not serving the same day, keep refrigerated. Note: to reduce fat you can use lowfat dairy, but do not sub nonfat dairy. The flavor will suffer. I prefer full fat ingredients, which have less fillers in them-- plus they taste better! I trust Tori implicitly, so I gave this recipe a try, thinking it would be good for Thanksgiving; however, I found it pretty disappointing. I’m glad I tested it out beforehand because I wouldn’t want to serve this to my guests. I have made and tasted my fair share of kugel over the past 40 years, and I found this really lacking. The flavor was passable, but not exquisite, and the texture, probably owing to the ricotta cheese, was horrible. It was grainy instead of creamy. I would not make this again without some serious alterations. I’ve been making my kugel with raisins and pineapple for years and when I found this recipe I had to try it. Made it for Christmas dinner tonight (we’re 1/2 Jewish and always have a kugel on the Christmas table). WOW!!!! SHEER PERFECTION. The BEST kugel I have ever made. I followed the recipe to a T. Did not add walnuts, though. For the topping I used crushed Corn Flakes and sprinkled sugar & brown sugar on top with a touch of cinnamon. This will be my go-to kugel from now on. Period. Thank you!!! This is great dish. My motherinlaw starting teaching me how-to do Jewish dishes in the 70’s. This sweet-kugel has always been my favorite. Delish. Your recipes look wonderful! Can’t wait to try! Why not make a Rum Raisin Cranberry Bread Pudding? I thought of that when I looked at your photo of a piece of Kugel above. I think Rum Raisin Cranberry Bread Pudding would taste much better than Rum Raisin Cranberry Kugel.